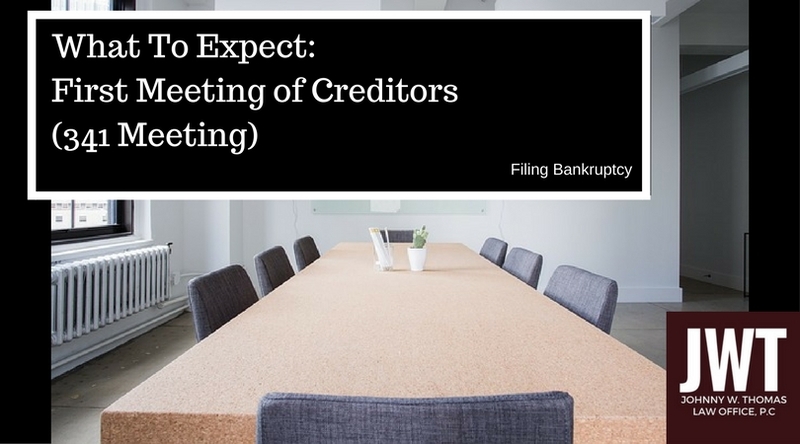 Once a petition for bankruptcy is filed, the bankruptcy court will set a date and time for the First Meeting of Creditors (also known as the 341 meeting.) The purpose of this meeting is to allow time for both the Trustee of the bankruptcy estate and any creditors of the estate to ask questions about the financial affairs of the debtor. If this is your first time filing bankruptcy, here are 5 things to expect at your 341 Meeting. You are meeting with a Trustee, not a judge. So what is a trustee? The trustee of the estate is like a caretaker of the property that is placed in the estate. Bankruptcy trustees are attorneys who have been appointed by the United States Trustee. They are not judges. There is no need to call the trustee “your honor” or judge. The trustee is tasked with protecting the property in the estate and ensuring the creditor’s claims are satisfied, if the property allows. Before the meeting the trustee has reviewed your petition and financial documents. The trustee may ask questions for identification and clarification. There will be other people in the room. Meetings with Creditors (341 meetings) are usually held in a room filled with other debtors and their attorneys. Though you will be speaking one on one with the trustee at a table, the meeting is not private. There is no need to worry about this. Everyone in the room is there for the same purpose. The trustee will ask YOU questions, not your lawyer. As stated before, the bankruptcy trustee has reviewed your petition and other financials before your meeting. The questions the trustee asks will be questions for identification and clarification of the statements you submitted. You will be asked to answer these questions honestly and to the best of your abilities. Your lawyer may intervene on procedural questions. Your creditors are also allowed to ask you questions. Again, this is the first meeting of creditors. Once the 341 meeting date is set, the bankruptcy court will send a meeting notice to each of your creditors. This notifies your creditors that you have filed bankruptcy. It also gives the creditors a chance to attend the meeting and ask any questions regarding your financials and in relation to their claim for a debt. Creditors are not required to come to the meeting, and many do not. Your case may be reset or continued for missing information, paperwork, or schedules. As your attorney will notify you before the filing of your petition, you must turn in all requested financial documents. If information is incomplete or not satisfactory for the trustee, the trustee may continue your meeting for another date to give you time to turn in the requested information. Worst case scenario, the trustee may file a motion to dismiss with the Bankruptcy Court. If the motion is approved by a bankruptcy judge, your case will be dismissed, you will not receive a discharge, and you will have to refile at a later date. If you need financial relief and would like to explore the option of filing bankruptcy, please speak with a bankruptcy attorney today.